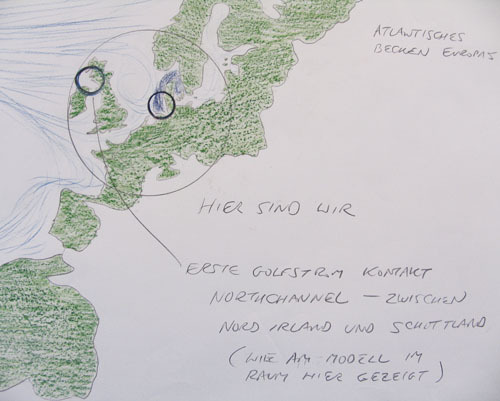 2006 - ..., a project by Peter Fend assisted by the Galerie für Landschaftskunst and it's research ship The Schute / Biological Field Station. Zur deutschsprachigen Zusammenfassung scrollen Sie bitte nach unten zum gelben Feld. 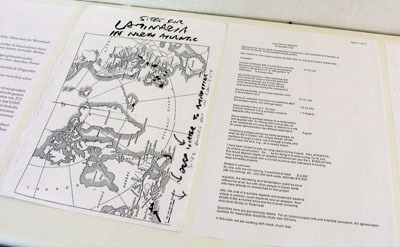 Model and table, with drawing of the North Atlantic warmwater circulation (1:10,000,000) and of the Canaries and Gulfstream Coast Currents (1:2,000,000). Together, these comprise a first submarine deployment area to reduce tropical storms in the Caribbean/Gulf of Mexico and to assure a strong Gulfstream. Deployment would also be needed in the coldwater currents, from the Arctic and Greenland. 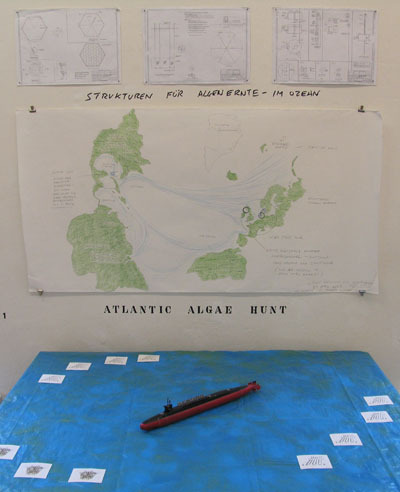 The title for all: Atlantic Algae Hunt. To assure the continued functioning of the Gulfstream, harvest the excess biomass in where the Gulfstream begins: the Gulf of Mexico and Caribbean Sea. Focus on any site where excess biomass appears, notably in red on SeaWiFS satellite surveys of phytoplankton. Often, the site could be the Loop Current, a slow-turning hub of the circulation of nutrients in the Gulf of Mexico. If this is warm and full of phytoplankton, then it can sharply increase the strength of a tropical storm. Harvesting can reduce the danger of more Katrina-type disasters. At the northern end, and in cold waters of, say, the Labrador Current, harvesting can help lower the temperature of coldwaters. This is vital to assuring a contrast between the Gulfstream and the waters from the North, so that the Gulfstream can flow northward unimpeded. 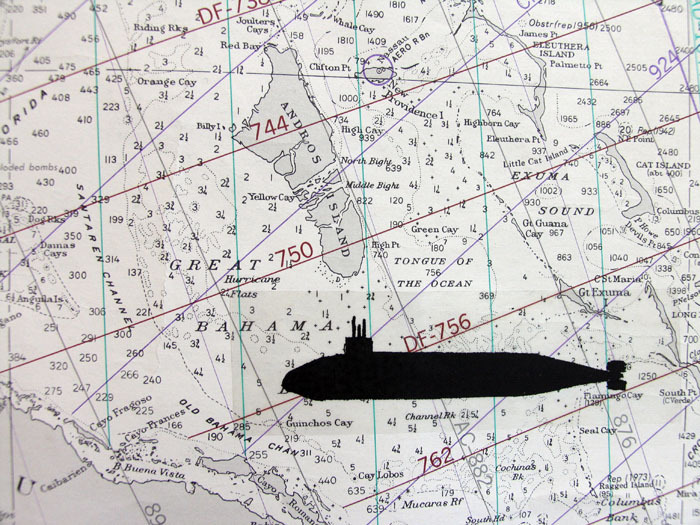 Submarines are used, rather than surface ships, because they can easily perform, underwater, beneath waves, without any heavy lifting, the industrial tasks of: collecting cut fronds of algae, drying and fermenting the fronds, yielding gas and ash by-product from the fermentation, and storing all yield, especially the gas, in a highly-concentrated form, as liquid. Very cold storage is required. Delivery of the liquefied methane is made to LNG terminals well offshore and underwater. 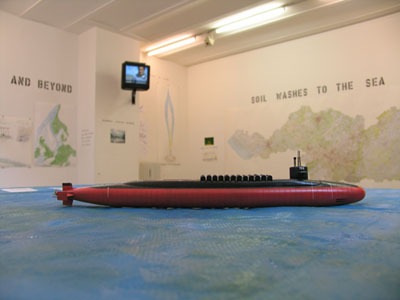 The width of the submarine is a bit more than that of this gallery. Collection is from wild crops or buoyed rigs. According to Dr. Gerald Boalch, who has supervised the initiatives by scientists worldwide to start an algae industry, one could best start in the coldwaters of the Southern Hemisphere. We aim for the Humboldt Current, partly because it is so fecund and partly because it produces clouds which rain on the Amazon and Orinoco Basins, directly affecting the Atlantic. 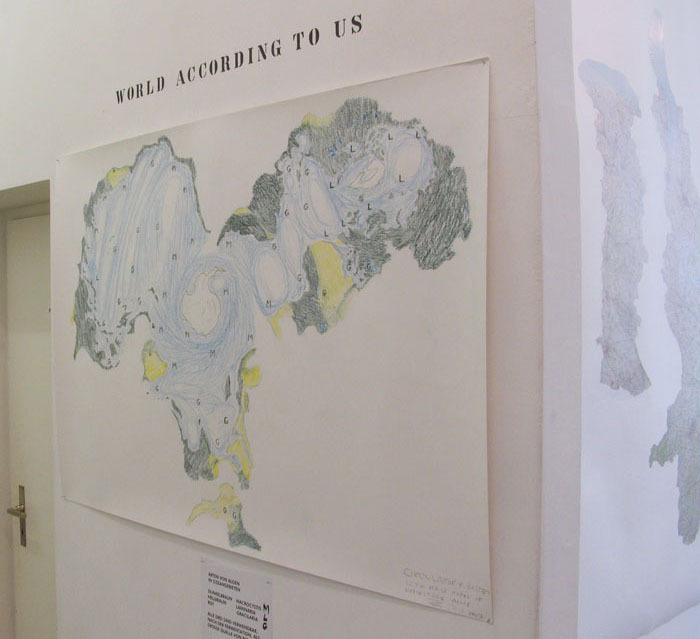 But we could also work in the Argentine Current and Benguela Current, off Southwest Africa. Such an ecological and economic campaign, aligned with natural forces, also co-locates with naval history. The algae campaign resembles what happened with submarines in the last century: from the Elbe, logistic needs call for a base in Mexico. Depending on the waters, rigs can accommodate bladder kelp, like fast-growth Macrocystis, or blade kelp, like Laminaria. For one, we use a cage. 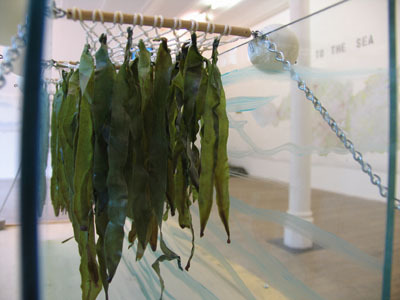 For the other, we suspend the algae from ropes. We show both types of rigs here. Also, the submarine can simply seek out and graze on wild stands. Divers or small submersibles would cut the fronds (either bladder or blade), then corral them for intake by the submarine. To curb costs, we try to not use divers. The sea with submarine, plus both types of rigs, is located within the warmwater cycles of the North Atlantic (except for the relatively still Gulf of Guinea). If French scientists were to follow through on their sensational results with Macrocystis in 1971, then the colder areas could have cages with the bladder kelp. But for now such is forbidden, in measures against importation from what is now a Southern and Pacific Ocean genera. 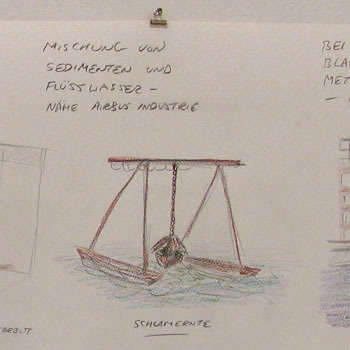 Naval-architecture drawings for the bladder-kelp rigs are shown, complete with spring buoys to absorb wave shock. They indicate how much is technically within our grasp. 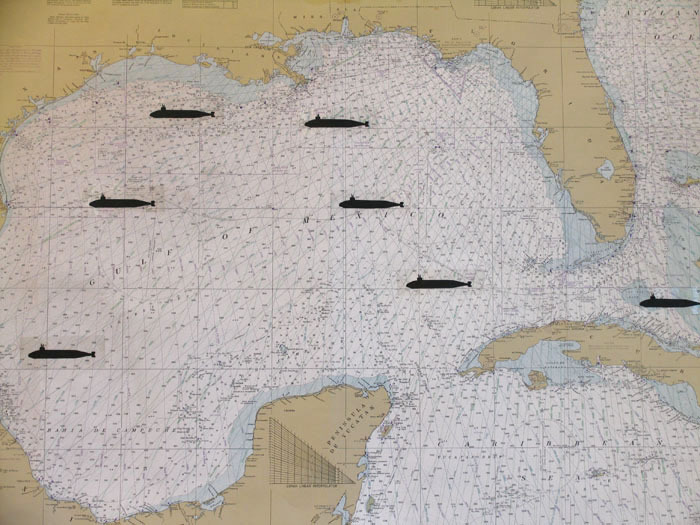 Flanking the North Atlantic and submarine, at the far ends of the wall, are two regional-sea bodies in a watery exchange: the Gulfstream from Key West to Cape Hatteras, sending waters to Europe, and the Canaries Current from Brest to Mauretania, sending waters back to the Americas. Each insloping land is a launch ramp for what Lawrence Weiner would call “an object tossed from one continent to another.” We position submarines for harvesting excess biomass. 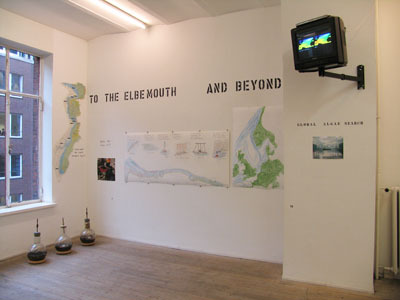 Beneath this heading appear two works, plus a promotional poster. 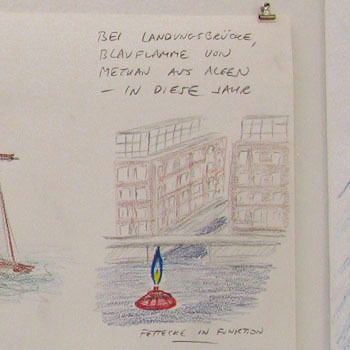 On the left, “Die Elbemündung in Betrieb,” appears a sequence of events from the North Sea, just outside the Elbe, to the canals and office blocks hard by the Galerie. 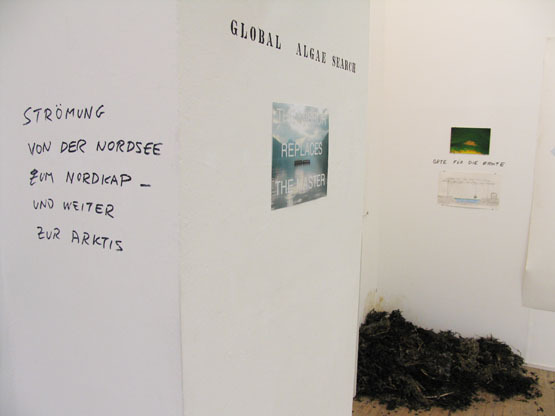 Only one of the events has been accomplished, as the poster to the left shows: hand-grab harvest of Fucus intertidal seaweeds from rocky shores. The slogan “Was Zu Tun Ist”, tells what has to be done: collect. Anyway you can, as if just to survive, collect the seaweed you can find. 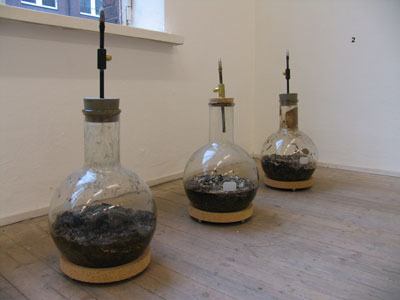 Then put the seaweed in sealed containers with anaerobic cultures inside, shown here in three flasks. Thus, produce methane. This is what we will be doing when the fossil fuels become scarce. Start with hard labor, then move up. 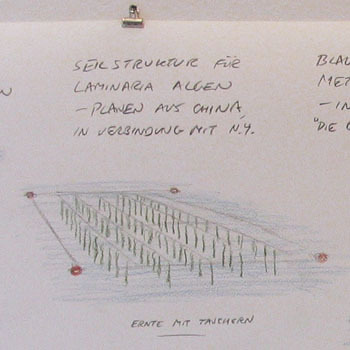 Six drawings, set against a map of the Elbe from the Sea to the City, show how: (1) deploy submarines for efficient machine-harvest and gasification, with frozen storage on board; (2) here and there, not everywhere, place buoyed, anchored rope rigs, usually in grids, to grow Laminaria or similar blade kelp; (3) At a local brewery, in Neudorf for example, use fermentation vats, or add more, to convert the harvested seaweed into methane gas; (4) conduct the gas by pipeline to home or industrial users, including an intermediate wholesale outlet, the post-petroleum gas station (Tankstelle), and symbolize this act with a small buoy offshore, near the beach at, say, Otterndorf, where a stream of methane can burn. The flame says, “wir sind unabhängig.” (5) Further inland, in shallows where waters are more fresh, vegetation in the water can be collected by gantry crane on slow-moving twin-hulled barges. Along the entire length of the Elbe, excess biomass is scooped up. A result appears in the city, in the heart of the financial and shipping-firm district, as another buoy with methane flame. Action on the Elbe is just a start. We follow the flows out to the High Seas. The Elbe and Weser streams pass along the west Danish coast, then get pushed into the Kattegat, the gap between Denmark and Sweden. There, as an Ocean Earth satellite survey showed in 1988, the detritus can jam, then rot, then spark a toxic microalgae bloom. Large-area growth of macroalgae, especially brown kelp like Laminaria, can absorb the excess nutrients better, with no toxic blooms and no eutrophication. Indeed, brown algae are beneficial to fish and shellfish; they prosper together well, with oxygen supply in the water enhanced. So, along the entire Danish coast, extending south to the Belt Islands, extensive brown algae growth protects the sea animals and helps assure strong fisheries. Recall that before the Industrial Revolution the Kattegat and Baltic (East) Sea just beyond were so rich in fish that a spear stuck in the water, anywhere, would make a catch. We aim to make that happen again. We notice where else the outflows from the Elbe go, on to the southern coast of Norway, then west and north into along the North Way - on to North Cape and the Arctic. The entire swirl of waters can be used. We plan now a test for Laminaria, leading to flame, on the Tees. The North Sea has been sweeping sand into a gap there. One can flocculate the sands, let them be absorbed by kelp using solar energy, then collect the kelp - all in a form of pre-emptive dredging. 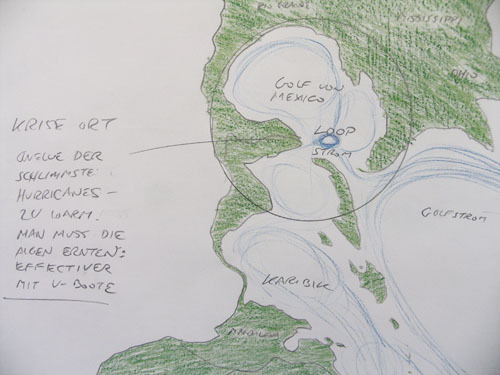 Both in the Tees mouth and the Elbe mouth, the harvest areas are influenced not by the river but by the salt sea. We speak of the “Einzugsgebiet” for the Elbe, but waters along the coast from Cuxhaven to Otterndorf, the first harvesting area, are not from the river. They are not from upstream. The “Einzug” extends along the northern half of the estuary on up the western coast of the Danish peninsula. 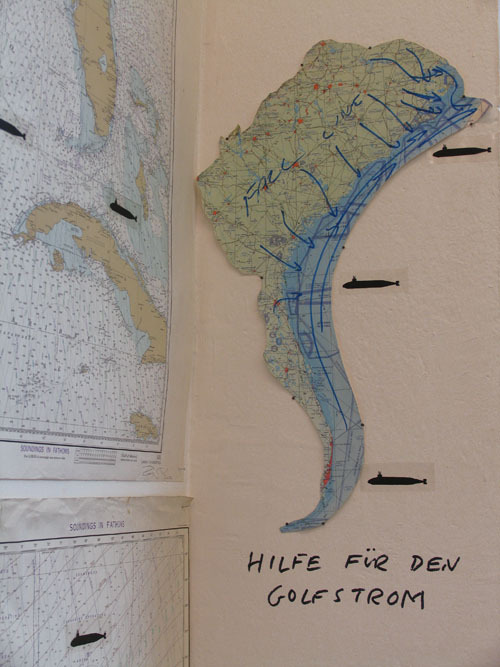 In terms of river runoff and consequent ocean bioproductivity, the Einflussgebiet, to use another term, extends northwards well beyond the large “Einzugsgebiet” on the adjacent wall. 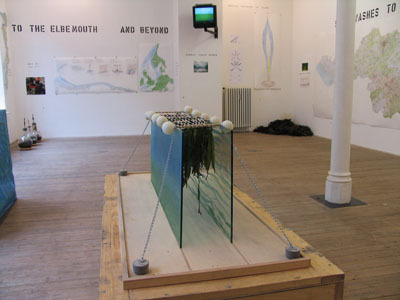 But if one must start with easily-accessed stands of algae, intertidal or offshore, then the south side of the Elbe mouth, like the North Sea side of the Tees mouth, is immediately suitable. 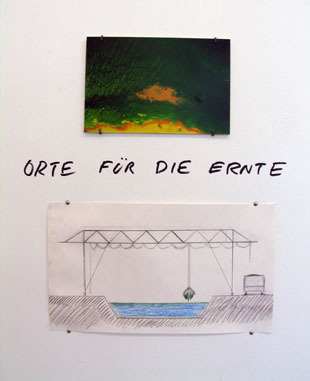 With Elbegas, we simply work out the implications of Fettecke, or “Fat Corner.” The concept was made public by Joseph Beuys. He enacted, through performance, how everything in life’s cycles should go through a Fat Corner, or paraffin phase. The paraffin, technically a pentane, is a low-molecular weight hydrocarbon. In twelve drawings, I analyzed the molecular process of building up Fat Corner. One starts with four molecules of water and four molecules of carbon, then lets them form two methanes, one carbon dioxide and one oxygen, with one carbon spare. Add a molecule of water to the carbon, do this to four other spare carbons, and the production multiples. The methanes, carbon dioxide and oxygen go into a triadic cycle between three types of back-and-forth exchange: between animals and plants, between bacteria and animals/plants, and between archaebacteria and bacteria. The process is summarized in a phrase: just add water. Without water, added-in four times four times four, no life exchanges can occur. Exchanges, to be complete, include decomposition of animals-plants to yield methane gas, the simplest hydrocarbon. This gas can be burned within the annual growth-decay cycles. On combustion, it releases water and… those spare carbons. One cannot wonder that in many societies, particularly with cold climates, flame is considered holy. The holiest flame, as shown in the flame-like “onion” turrets of Russian churches, is blue - from methane. We produce such a flame, as an ad if not as an icon. The rawstoff, in this case the Fucus algae grabbed from intertidal rocks, is deposited in the corner. 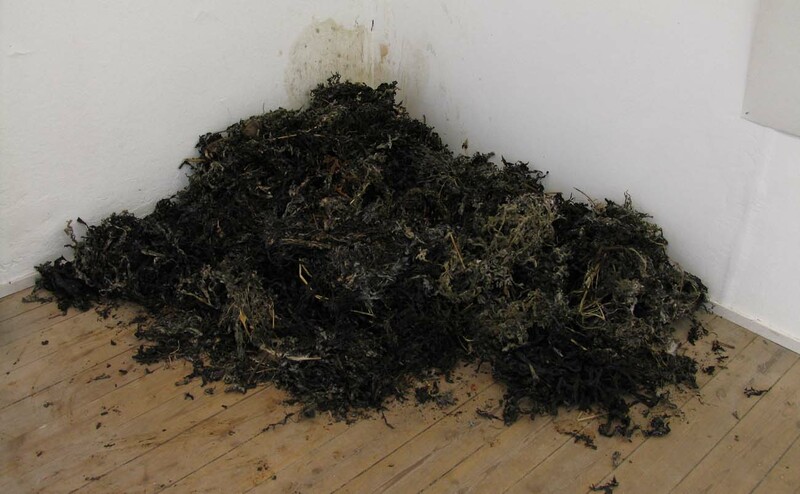 Standing there, this will gradually decompose and ferment for the duration of the exhibition, producing a mild smell of methane gas. As no fermenter is used to accelerate the conversion, there is no viable fuel and no flame. 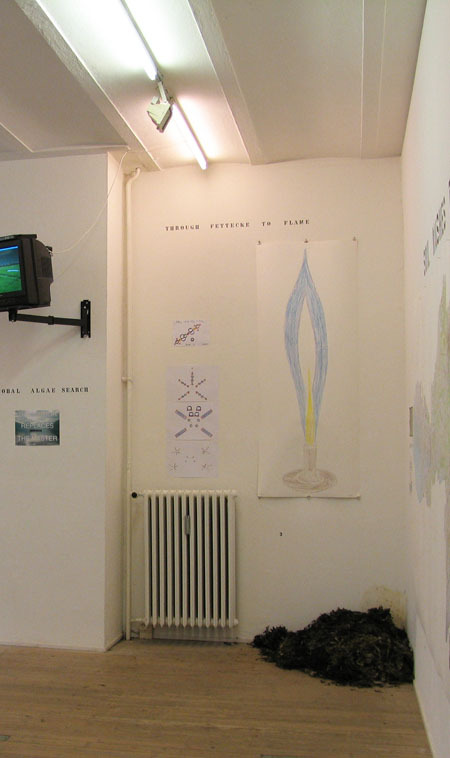 Such flame was produced by us just once, with the displayed flasks: in the UK, in 2001, during the 9/11 crisis. There may be art in its concept: it is a natural example of the Marcel Duchamp „Fountain“, or Urinal. But there is no art, or expression, in its production. 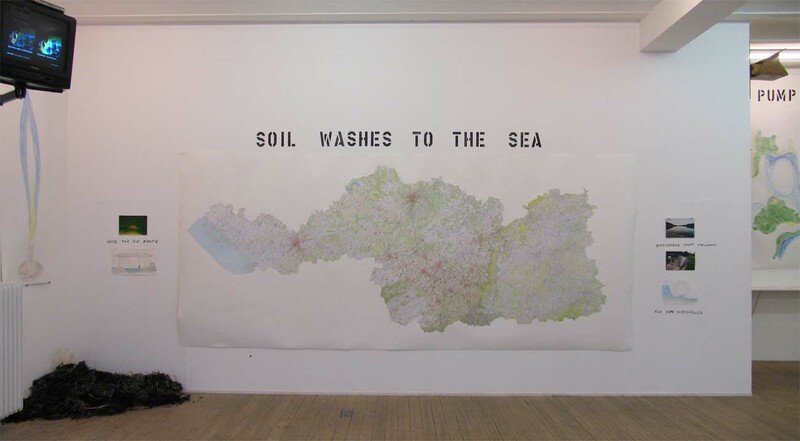 One simply assembles and dry-mounts government charts of 1:200,000 scale for this drainage basin, leading into a body of saltwater which could be considered a “Hydrometric Area” under rules of the European Union Water Framework Directive. A body of saltwater bounded by two outermost points, at Cuxhaven and Sylt, is mapped together with all the waters draining into it, through the Elbe. 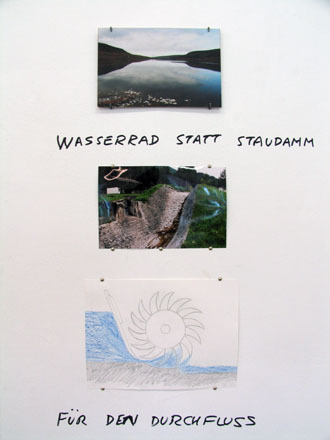 To the right are illustrations of: (1) a characteristic upstream site, a mountain lake (in this case, with nutrient-rich feathers strewn on it, ostensibly from advanced urban waste recycling systems), (2) what had been, only a century ago, a local source of energy that lets all nutrients and small life forms get through, without tourniquet blockage, an undershot waterwheel, and (3) how such a waterwheel would work, if installed. 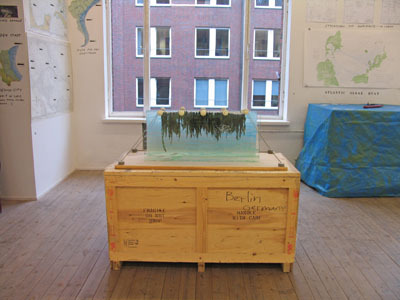 To the left are illustrations of: (1) a characteristic offshore algae field, in this case kelp; (2) an inshore gantry crane, on wheels, for scooping up biomass in the water even before it reaches the sea. 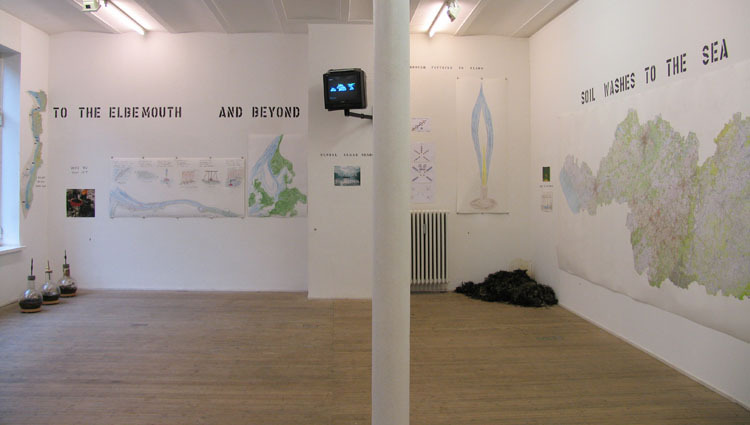 In between, in the map, lies what could be regarded as a production unit for energy from water-based plants and, letting the life forms and nutrients get through, undershot water wheels. The wheels can be hitched up with machinery costing under 100,000 Euros, or leasing for much less, to yield both local electricity and, with electrolysis of distilled water, fuel hydrogen. Soil washes to the North Sea also in several “Einzugsgebieten” to the west of the Elbe. 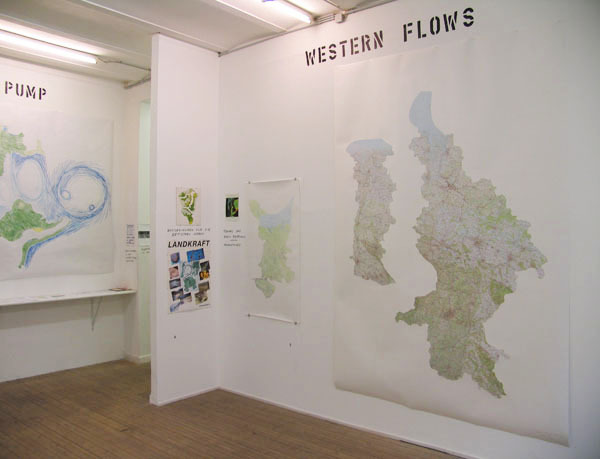 We emphasize two immediately adjacent rivers, the Weser and Ems. The hydrometric area, extending offshore the legal few miles (1 to 3, or even 12, depending on which law to use), is mapped at 1:200,000 scale. 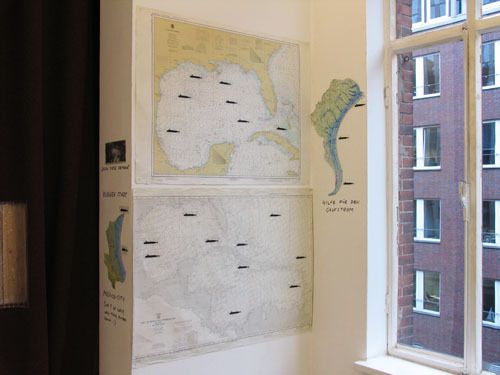 These three 1:200,000 scale charts comprise an area which could be recognized by energy-supply companies such as EWE. Its acronym stands for “Energieversorgung Weser Elbe.” We show here the Weser and Elbe, and we can add to that the quite small Ems. 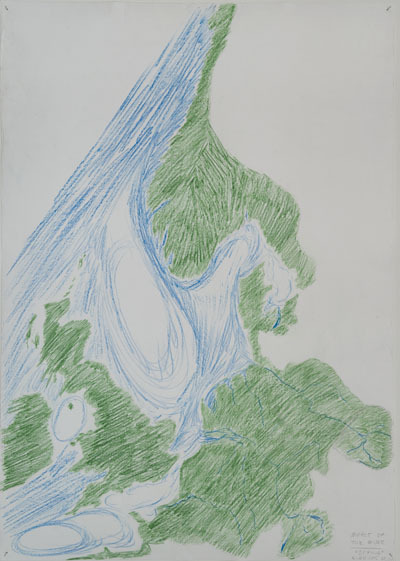 To the west, however, is a river basin with outflow, both in nutrients and water, greater than that of all other rivers in the North Sea Basin combined: the Rhein-Maas. 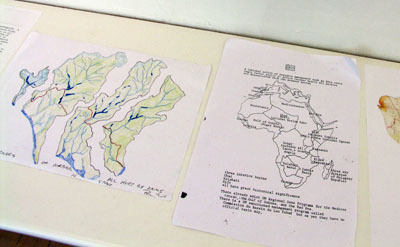 The hand-drawn map is made at 1:1,000,000 scale. SeaWiFS satellite imagery, upper left, shows what happens in the Sea: a massive bloom of phytoplankton. From the Sea viewpoint, or fish viewpoint, a convergence occurs from the Rhine-Maas, and the Schelde… and the Thames. All these are drawn together. 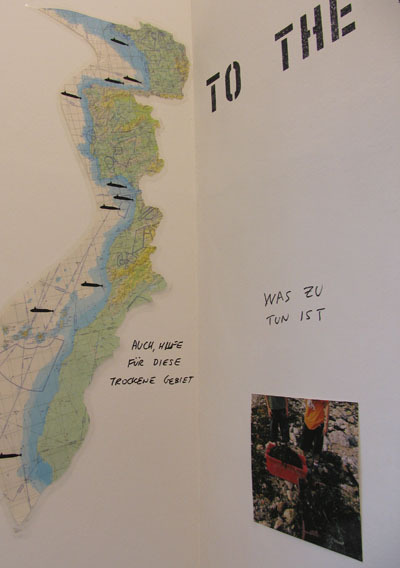 A scenario for the entire North Sea Basin, with the Rhine-Maas as the dominant influence, is summarized in “Landkraft.” The title is newly-coined. 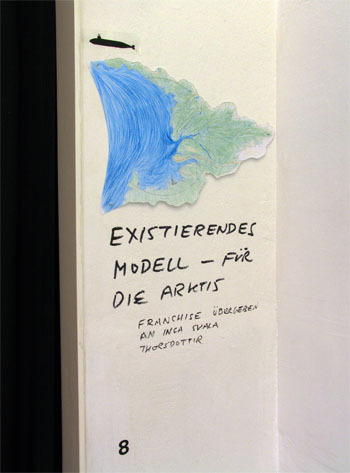 It plays on terms like “Wasserkraft” and “Kernkraft” or “Windkraft” to emphasize that in any salt-sea there is around it an “Einzugsgebiet”, or concavity draining inward, in which the primary wealth comes from the land. “Soil washes to the sea” within this concavity. Above, we show the “consequences” for the British Isles: division into Einzugsgebieten for the North Atlantic Drift, the Irish Sea, the English Channel and the North Sea. One need not see such partitioning as hostile. Rather, it allows the British Isles to “get their ecological act together.” One can see from the SeaWiFs imagery that phytoplankton on the coasts are not plentiful. Analysis of detailed maps shows why: nearly every river, even every stream, has its normal sediment and nutrient flow to the sea blocked by hydroelectric dams. These constructions of the past century explain how photographs of hundreds of fishing boats in, say, The Wash are only from, yes, a century ago. The conditions for ocean productivity have been destroyed. Slope by slope, river by river, stream by stream, the British need to de-build the dams, allow natural-filter dams by beavers to occur instead, and confine hydroelectric schemes to run-of-the-river technologies, like undershot water wheels. The measures sound quaint. Maybe they “are”. But they work. The Isles divided thus can begin to tackle the challenge of bringing their coastal waters back to life. The Blue Planet, unlike anywhere else we now know, is covered in water. Almost 3/4ths are in the ocean. Almost 9710ths are in the ice caps of the North and South Poles. At all times, some water is in the air, as clouds. 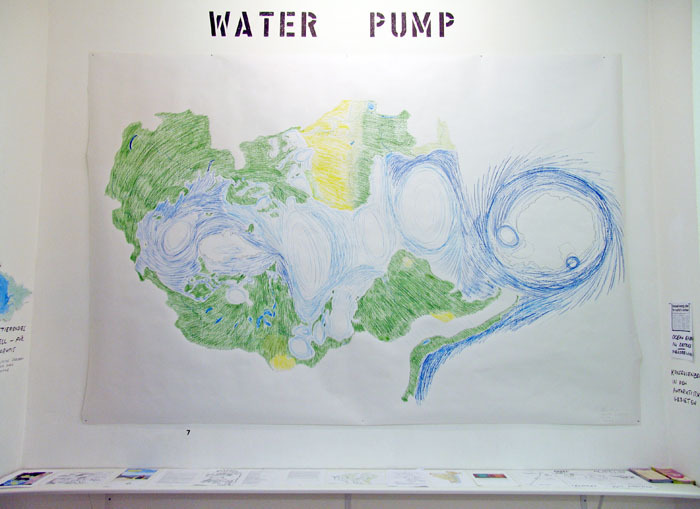 A major pump, perhaps the main pump, drives both clouds and seawaters from the South Pole northwards to the Equator, and then onwards to the North Pole, and back. Nearly all the exchange between Poles is in the Atlantic. Seawaters spin northwards from Antarctica into the Argentine Current, converging then on the Benguela Current west of Africa, and they drive northwards past Angola and the Congo to the Equator, where they veer west, with some streams bending south, some bearing north, where they get sideswiped by a colossus of freshwater from the Amazon and Orinoco. That colossus gets its water from cooled cloud flows, cooled evaporations, from the world’s biggest northward bearing current, the Humboldt Current, on the other side of a long, uplifting rod extending from Antarctica: the Andes. Here at the collision of Amazon / Orinoco and Atlantic, some waters head back east to Africa, restoring vegetation to what otherwise would be desert, and most waters keep streaming west and north, into a series of pools called the Caribbean, Cayman Sea and Gulf of Mexico, and then hug the western shore of the Atlantic until, at the sand bars of Cape Hatteras, they meet cold waters descending from Greenland and Labrador, consequently bear east, and are pushed onward into the Arctic. Along the way, some waters lap into a shelf, like a sill around a bathtub, called the Irish, North and Baltic Seas. Some waters lose their momentum and get pulled south, to start a flow back to the Caribbean. Most waters stream onward into the Arctic. There they spin around the North Pole, picking up much-colder flows from Siberia and Canada, and head south. Normally, being colder, they go deeper and deeper, diving under the Gulfstream to re-surface only where all the water up higher has the same temperature: namely, the giant gulf at the south end of the Atlantic, the Weddell Sea, Antarctica. Variations, however, are setting in. What has normally been ice is melting, releasing more freshwater than usual into the Arctic flows. If the flows are salty and cold, they sink. If they are less salty, they don’t. They start to get in the way of warm waters being pushed north, like the Gulfstream. Everyone knows the danger: that the Gulfstream might truncate, the entire cycle derange, violent storms break out. The water pump needs restoration, fast. This includes a sweeping change in the fuel base, leading to zero emissions worldwide. It also includes action at critical sites, at where the cycles are now most distorted. Sites now: Jamaica Bay into Hudson and Baltimore Canyons, Amazon outflow, Iberian peninsula, Congo outflow, Labrador rivers, Siberian rivers into the Arctic, Rio Plate outflow, warming in the Gulf of Mexico and Caribbean. This chart of global north-south cycles, from Pole to Pole, helps show us where to act first. 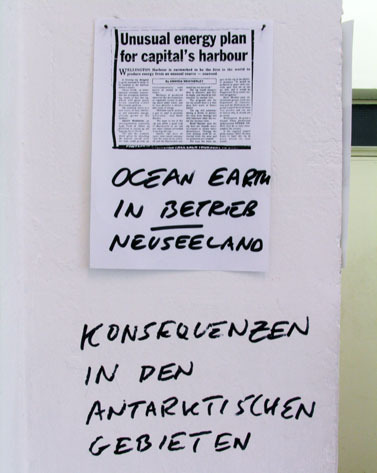 Given the advice of Dr. Boalch, we might focus on the gyre around Antarctica, particularly in its biggest offshoot, the Humboldt Current and waters off Chile and Peru. But given what we know about dams, we might campaign to undo nutrient blockage where it has most deeply reduced sea life: Labrador, Iberia and the Rio Plate. And how can one avert destruction by dams and deforestation in the biggest cloud-generator, the Amazon? In other parts, like the Gulf of Mexico, the runoff is in excess: what can be done to absorb that? Chile coast entire, Macrocystis: the next big thing. Wellington Harbor, New Zealand. Spin off from Antarctica. Three areas within the Atlantic Corridor, extending from Antarctic to Arctic, with near-spinoffs to Southern Ocean islands like New Zealand. 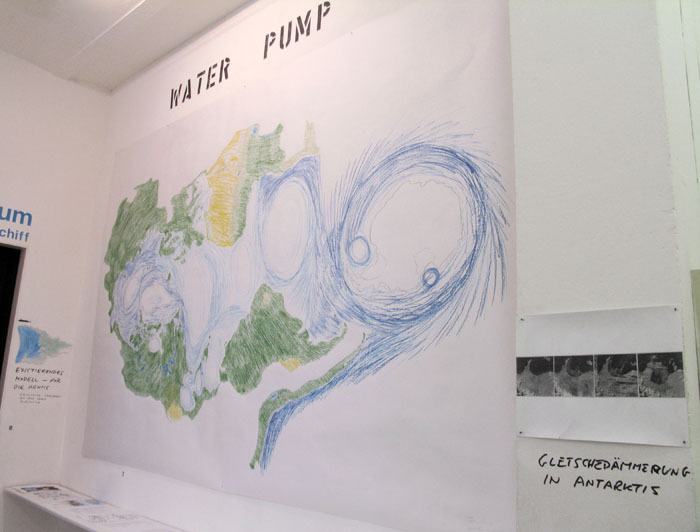 A hydrometric area identified in response to a request from Inga Svala Thorsdottir to try developing the algae-gas industry in Iceland. 1993-8. On the Arctic question, note that Iceland lies in between two giant ocean flows: from the Gulfstream towards the Arctic, with some waters cooling off and descending into a return cycle: from the Arctic bearing south, hitting the north coast and veering off west or east to dive beneath northward-bearing warmer waters. Iceland hosts the headquarters of the UN Regional Seas Program, part of the United Nations Environment Program, for the Arctic Ocean. News article based on permission for use of a 30-meter deep site in Wellington Harbor granted to Heidi Mardon, architect. She had contracted with Ocean Earth to find a site for testing a submersible Macrocystis rig, then finding out what methods of maintenance and harvest are most efficient. The use of divers or submersibles was budgeted, and overall cost for a three-year project was set at 300,000 Euros. Attempts were made in the art world, e.g., at American Fine Arts Company, NY, to raise the sum; they failed. 1998. Since 1988, the Russian inputs to the Arctic have been separated out as these large regional sea basins. The Kara and Laptev Seas, with in-flowing rivers, are vast. We offer such partitioning into renewable-resource districts in response to recently-declared Russian ambitions to drill for oil under the Arctic seafloor. Laminaria harvest in the blue light under Arctic ice would be faster, easier and far less damaging. 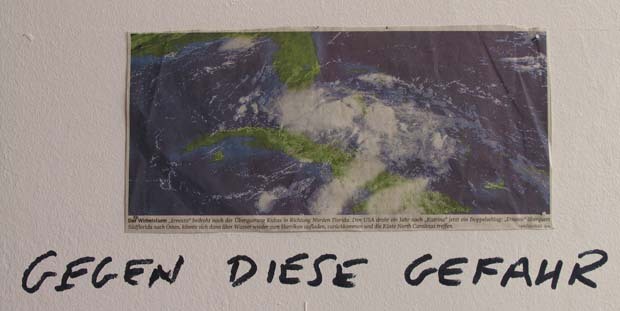 In July 1999, when NY was melting in the heat, the artist went to an off-season gallery opening, stepped out to the garden in back where drinks were being served, and find himself right behind an Exxon gas station. He immediately wanted to stick a message in the signscape. It would advertise what they really produce. People have since said this was the best case of “public art” in Manhattan. 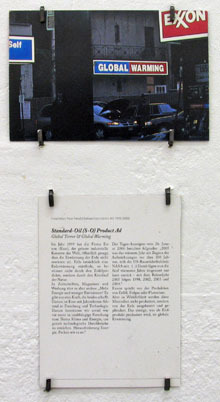 But: (1) even though the original sign and versions thereof have been sold about 20 times, not once has any buyer or supporter allowed for another display in the context of gasoline and cars, so the work has been reduced to art object instead of public message; (2) the NY Times reported the sign as news, not as art; (3) the sign became such an attractant that it improved sales at the gas station, Apparently, people like feeling guilty. As a call to action, for example in this show, the sign was a total failure. 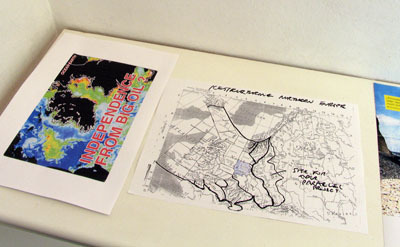 Numerous designs for stations were developed and exhibited, with products including, under color code: methane (green), methanol (red), ethanol (yellow), hydrogen (blue), bio-diesel or kerosene (purple), electric power (white). The group later became an “autonomous part” of Ocean Earth. RAPID could function in the Elbe, Weser, Ems basins, relying on methane supply through “Gasleitungnetz” from EWE. Now that we have trashed the fossil competition, it’s time to start up the renewable alternative. This depends primarily on the Gasleitung: with such a piped-in delivery, the station can compress the gas to sell CNG, or can reform the gas to produce and sell hydrogen, or can convert the gas, in certain cases only, to methanol. Only ethanol and bio-kerosene would be trucked in. 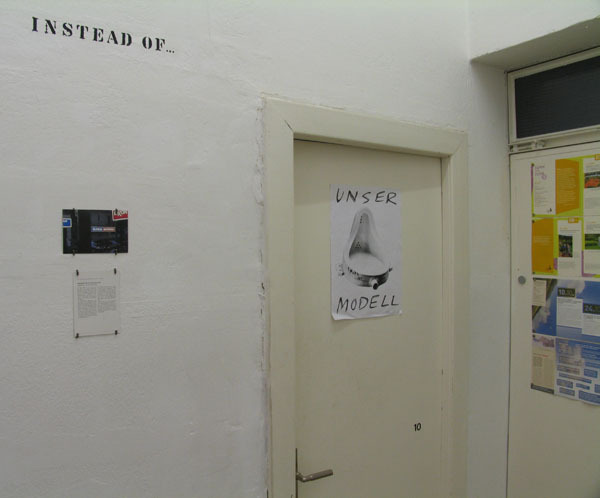 The RAPID light box sign, prototype (methane) pump and marketing paraphernalia (such as a “Rapid Response” gas-station suit) have been purchased by a prominent Berlin collector who is also busy trading in real estate. Given the profession, this collector has the professional capability to set up a network of RAPID brand post-petroleum gas stations throughout the Elbe Einzugsgebiet, or also the Weser and Ems Einzusgebieten. After all, if you are going to produce methane, a primary feedstock for post-petroleum economy, you should convert it into saleable products as fast as possible, and as near as possible to the source. Marcel Duchamp left France for the relative safety of New York and conceived of an icon, called “Fountain.” It is a urinal. The urinal is not a joke. Since it is the “most influential,” we should be influenced by it. We make it into our model no less than in earlier times one would have made the Madonna (mother) or crucified Christ (father) or Buddha (wise man) our model. Jack Burnham has much to say about the new icon from Duchamp in his books “Beyond Modern Sculpture” and “Great Western Salt Works.” Point is, if we are to no longer have a person be our model, we must therefore abandon notions of “stare,” or “standing”, leading to the concept of a king or queen-led “State.” Instead, we consider the political ideal, the unit of sovereignty, to be a urinal. Or, to use a German term, “Einzugsgebiet.” Forget the Fatherland or Motherland, and don’t try having “homeland security.” Concentrate instead on the integrity of each hydrometric area. Concentrate instead on each saltwater basin. This becomes the “Reichtum,” the wealth unit, within which human energies are organized. The artpiece in this work is the latter, by Fend. 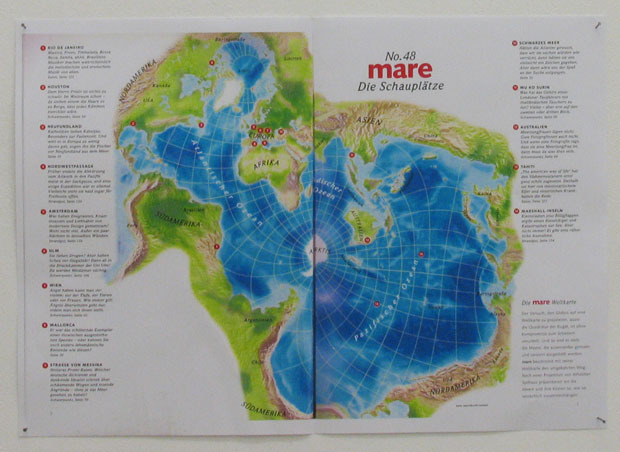 But the work is placed alongside the design by “Mare”, the ocean magazine of Grun + Jahr in Hamburg, to demonstrate that Fend’s mapping is not so radical. 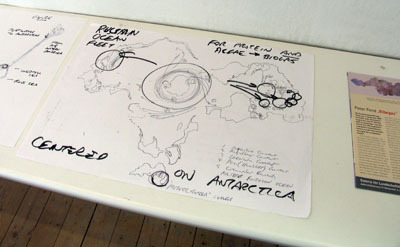 Grun + Jahr also centers the planet on Antarctica. 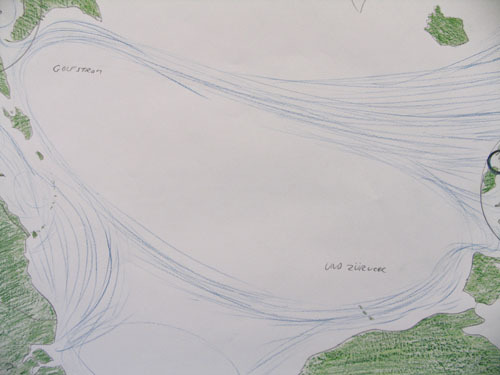 Grun + Jahr also acknowledges that the world ocean swirls around Antarctica and circulates in and out of three giant concavities, the Indian Ocean Basin, the Pacific Ocean Basin and the Atlantic Ocean Basin, which extends further into the Arctic Ocean Basin. 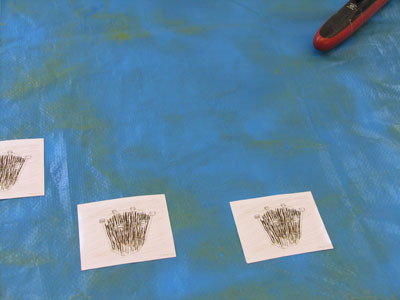 The chief difference between the “Mare” version and Fend version is precision. 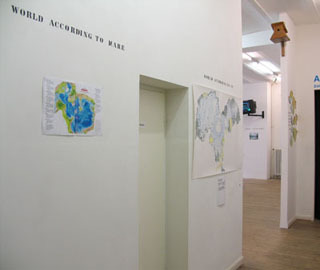 All the cartography in Fend’s version is based on ocean-basin cutouts from 1:2,000,000 aeronautical charts in Lambert projection, and the drawing of the world in its three basins around Antarctica is assembled from photographs of the ocean-basin cutouts from 1:2,000,000 aeronauticl charts. That is, there is very little distortion within each basin. Scale is fairly uniform throughout. The seas are splayed out much as a pineapple might be split. In the “World according to Us,” the letters G, L or M are written. These stand for three kinds of large algae which are relatively easy to harvest and have good conversion rates into methane if anaerobically digested: Gracilaria types of algae, in tufts, or “Medium” size; Laminaria types of algae, with blades, or “Large” size; Macrocystis types of algae, including Ecklonia, with bladders, or “Giant” size. The three types require different rigs. Gracilaria requires long rope rigs, with many attachments. 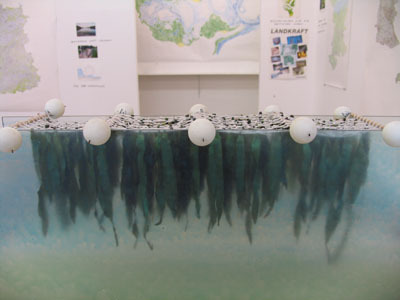 Laminaria requires more open rope grids, with less dense attachments (see the floor model). Macrocystis requires attachment to be well-below the sea surface, from 10 to 50 meters below: the naval architecture would probably be of cages; we propose hexagons. 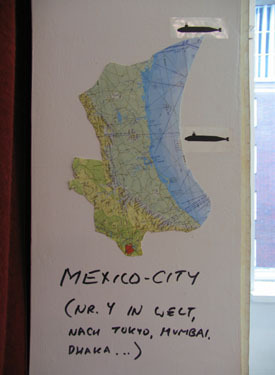 The letters are distributed around the world according to where they occur in nature. For reasons not yet grasped, there has been a very strict rule that no species or genera or type of algae shall be transferred from where it exists now in nature to another location. The contrary has happened with land plants. Potatoes, for example, were introduced from the Americas. And the contrary has happened with land animals. The horse was introduced to the Americas by the Spaniards. But oceanographic science, particularly under the vigilant watch of Dr. Gerald Boalch, himself seated at The Citadel in the city with the largest navy base of Europe, has blocked any efforts to do anything with algae that is not already on site. Let’s consider the chart as a register of what is possible to grow or harvest where. Just as the tractor has become a fixture of farms, or the automobile of roads, so can the algae rig become a fixture of the sea. It functions to absorb nutrients in the sea for degradation back to industrial methane and other raw stuff. 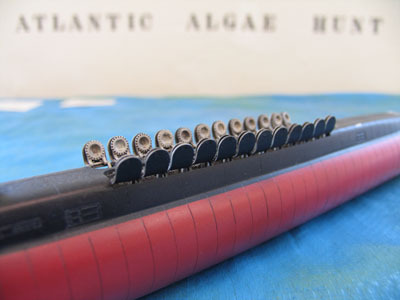 An algae rig, unlike a tractor or auto, can be astonishingly cheap. It can be simple: just a grid of ropes held in place by anchored buoys, with rapid-growth algae attached. That works in sheltered or shallow waters for large kelp, such as Laminaria, or medium-sized tuft algae, like Gracilaria. In East Asia, such rigs are Tradition. But what about casting rigs into less sheltered, more open waters? What about making them able to submerge during storms or rough seas, to avoid algae breakup? What about making them more seaworthy? And what about speeding up growth and harvest rates with mechanization and regular trimming rather than full-plant harvest? 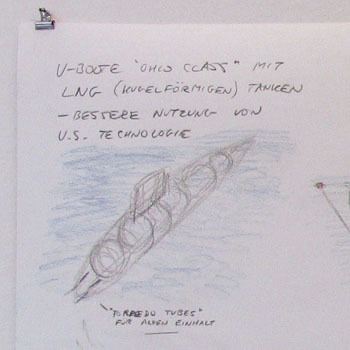 This model here follows drawings of traditional Chinese design, as published in the proceedings of a Chinese-US conference (1983, when they were sharing ideas) on algae-rig engineering for - yes, they were thinking of it then - methane gas production. 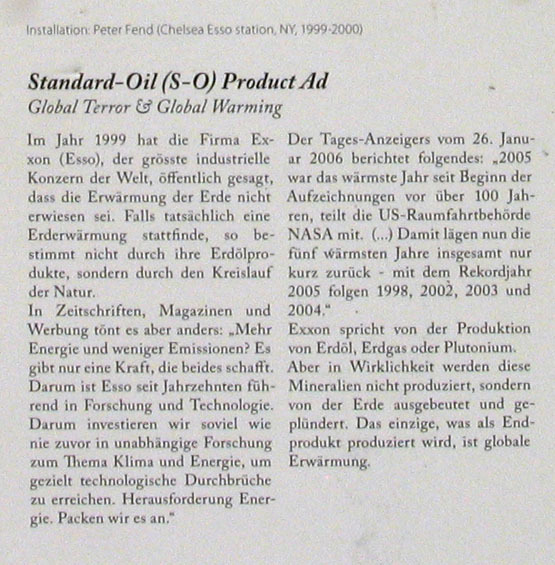 The model is executed by a founding shareholder of Ocean Earth Development Corporation, Eve Vaterlaus. It models one of the simplest of all rigs. 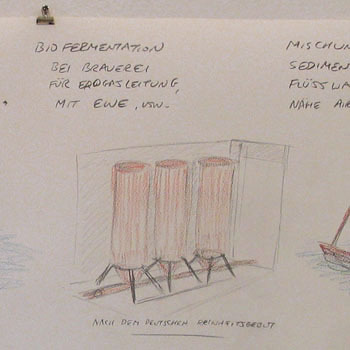 Technical drawings on the wall above (1) suggest that more complexity is possible: we would focus on spring buoys and ballast tanks, for submersion, to nullify dangers from storms. The video monitor would normally show, with this title, how we process frequently-telemetered oceanographic satellite data to keep track of algae blooms. 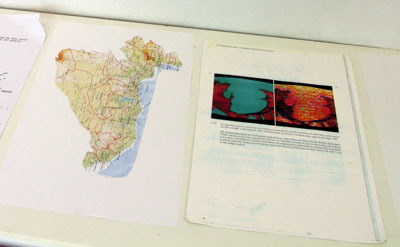 On this monitor we display: (1) comparative studies of phytoplankton and suspended sediment in NY Bight, which sends cold waters deep towards Antarctica; (2) the change in sea-surface temperature monitored by AVHRR sensors on NOAA satellites between 1982-2002 and 2003 in the North Atlantic, showing a distinct warming trend, particularly in the Caribbean and Gulf of Mexico, a hurricane center; (3) SeaWiFS observations over a year’s time, with each month averaged, in Europe, showing phytoplankton productivity and hence seaweed harvest potential; (4) SeaWiFS observations over a year’s time in two comparative regions, the Canaries Current and Gulf of Guinea on one hand, and the California Current and Central American Current on the other, In both regions, the second current is a weak extension of the first., (5) a SeaWiFS annual calendar of the entire Atlantic Ocean Basin, the main region in the Water Pump; (6) the same phytoplankton-revealing imagery for all three major basins around Antarctica: Indian, Pacific and Atlantic. Other video footage, by Tillman Terbuyken, shows our efforts to collect intertidal seaweed in the saltwater stretch of the Elbemündung between Cuxhaven and Otterndorf. The main lesson learned was: cropping is easy, transport is very hard. Do what the handworkers do in Connemara, Ireland: gather all the cut or pulled seaweed in the water, pull it into a net, then drag that in the water. Don’t take anything out of the water. Let boats do the transport. Do not do what handworkers in Brittany do, for example at the Centre d’Etudes pour la Valorisation des Algues: pull the seaweed out of the water onto wagons, then haul the heavy, waterlogged load to dryers, fermenters and other storage areas on land. Because one must roam, covering large stretches of territory, the manufacturing and conversion tasks should be on board as much as possible, to avoid the hard work of carrying heavy unprocessed bulk across land. The photo is of a shellfish farm, which can co-exist very well with brown algae, such as Laminaria and Macrocystis. 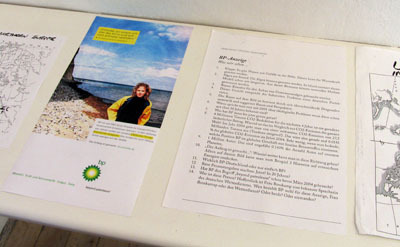 We conclude where we started: with a U-Boot campaign for the Atlantic. With any fleet, one needs a destination. Going out and back with no destination, with nothing at the other end, is tough. Thus, during World War One, the Germans sought a U-Boot base in the Veracruz province of Mexico, on the western shore of the Gulf of Mexico. The Mexicans would want something in return, and the Germans offered help in winning back lands lost to the United States in 1848. Uh, oh. Okay, but the task remains. One needs a terminal on the far shore. Therefore, it makes very good sense, logistically at least, to create a large LNG base and market on the far shores of the Atlantic, at the other end of an algae-gathering and gas-production venture originating, say, in northern Europe, in the Elbe. One could well work with the list of most heavily-populated cities. The list now goes: Tokyo, Mumbai, Dhaka, Sao Paulo, Mexico City, Karachi, New York. Within the Atlantic Basin, this means we can target for giant markets in three megalopolis: Mexico City, Sao Paulo and New York. That is our aim. Mexico may be the best place in which to begin, for the ecological need for a new fuel is most urgent. The “urinal” of the city, also, functions for our purposes. 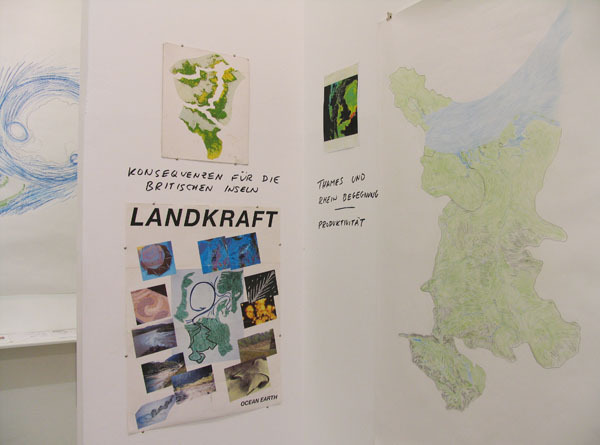 Ein Projekt von Peter Fend in Kooperation mit der Galerie für Landschaftskunst und der Schute / Biologische Forschungsstation der GFLK. Das Projekt „Elbegas“ des Künstlers und Architekten Peter Fend begreift das Einzugs- und Mündungsgebiet der Elbe als Energiequelle. Im Hamburger Hafen und im Gebiet der Elbemündung lagern sich anorganische und organische Stoffe ab, die von Bächen und Flüssen aus weiten Teilen Tschechiens, Ost- und Norddeutschlands hierher zusammengetragen werden. Die eingetragenen Nährstoffe dienen den Wasserpflanzen zum Wachstum. In dem Projekt „Elbegas“ werden diese Wasserpflanzen geerntet und fermentiert, um aus ihnen Biogas für eine nachhaltige und klimaschonende Energieversorgung des Elbegebietes zu gewinnen. Algenfarmen und Fermentierungsanlagen werden am Fluss errichtet. Eine U-Boot-Flotte erntet die Wasserpflanzen Off-Shore in der Nordsee und im Atlantik. 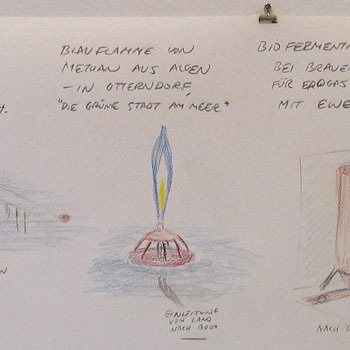 Eine Boje mit blauer Gasflamme soll bei den Landungsbrücken als Zeichen für den großen Energieraum Elbe schwimmen. Florian Hüttner (Assistenz), Lina Hakim (Grafik: Elbe-, Weser-, Ems-, Rheingas-Logos nach Zeichnungen von Peter Fend), Till Krause (Organisation und Assistenz), Kornelia Paul [Petersen] (wissenschaftliche Begleitung). Peter Fend, Florian Hüttner, Ricarda Köneke, Till Krause, and Victoria Sanchez. Peter Fend assisitiert von Tillmann Terbuyken. Konzeption, Kamera, Schnitt Florian Hüttner und Ralf Weißleder. Öffnungszeiten: Do-Fr 11-13 Uhr und 15-19 Uhr, Sa 12-15 Uhr und nach telefonischer Vereinbarung. 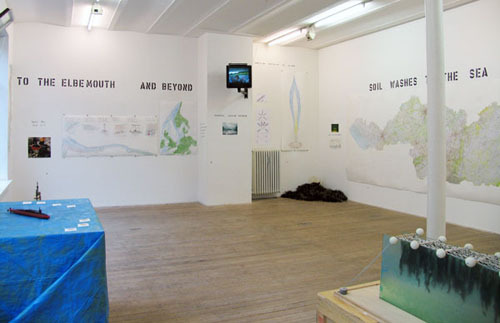 In der Ausstellung in der Galerie für Landschaftskunst wird das Projekt „Elbegas“ in Zusammenarbeit mit der Hydrobiologin Kornelia Paul erläutert und das Für und Wider reflektiert. Eine Sammlung der Wasserpflanzen des Elberaumes wird aufgebaut. Außerdem wird die Ausstellung von einem Archiv zur weltweiten Algennutzung durch Menschen begleitet. 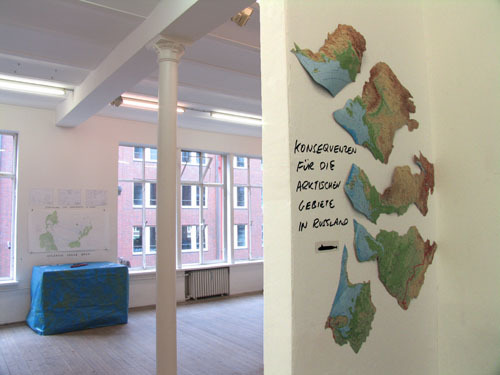 Die Umsetzung des Vorhabens wurde 2008 abgebrochen, da das Vehikel und der Arbeitszusammenhang für die Umsetzung, die Schute / Biologische Foschungsstation der GFLK, von Anderen als Eigenbesitz beansprucht und ihnen, da die Schute nicht die Idee des Besitztums verfolgte, als solcher überlassen wurde. "[...] In twelve drawings, I analyzed the molecular process of building up Fat Corner. One starts with four molecules of water and four molecules of carbon, then lets them form two methanes, one carbon dioxide and one oxygen, with one carbon spare. Add a molecule of water to the carbon, do this to four other spare carbons, and the production multiples. The methanes, carbon dioxide and oxygen go into a triadic cycle between three types of back-and-forth exchange: between animals and plants, between bacteria and animals/plants, and between archaebacteria and bacteria. The process is summarized in a phrase: just add water. Without water, added-in four times four times four, no life exchanges can occur. [...]"